Argyll Estates and Argyll and Bute Council Archives are developing a project to catalogue and conserve the family and estate archives in our care. Working in partnership with community and heritage centres across Argyll, the project will also digitise records of special importance to local and family history, so that they may hold copies locally to support their own projects and other activities. Many of the records are of national importance, and we also wish to digitise a small selection of the most valuable of these. The archive catalogues and digitised records will be made freely available online. The project includes around sixty small and medium-sized collections held by Argyll & Bute Council Archives, including the family and estate archives of Campbell of Kilberry, MacTavish of Dunardry and Malcolm of Poltalloch, along with antiquarian papers, solicitors' papers and miscellaneous small collections of local and family history interest. It also includes the very substantial family and estate archive of the Campbell Family Dukes of Argyll (the Argyll Papers) which is held at Inveraray Castle. The project will run for three years. Professional archivists and conservators will undertake the main cataloguing and conservation tasks, but we will also need volunteers to help with listing and re-packaging, and hope to set up transcription and indexing projects to make some of the most important family and local history sources accessible to a wide audience. We will hold open days, talks and exhibitions throughout the project's duration, and will develop a local history course introducing researchers to using archives, with emphasis on family and estate papers. Many of the local heritage centres we will be working with curate their own archive and museum collections, and act as local tourist 'hubs' for family and local history research across Argyll. The project will also develop a training and men to ring scheme to support these groups' curatorial responsibilities for their own collections. Following Ms. MacKinnon's highly informative and entertaining talk to the Society on 19 March on the Argyll Estate Archives, we have arranged to have her back for more of the same in February 2015. Campbeltown is a small community, often described in any national media exposure with cosy phrases such as 'close-knit' and 'sleepy'. Although predictable, the onlookers are quite correct. Situated around a natural harbour, Campbeltown is a town of quiet distinction; the furthest town from any other in the United Kingdom, with 51 miles between it and Lochgilphead in Mid Argyll, and the most southerly town in the Highlands. It is geographically distinct, but in so many other ways it has exceptional qualities. An ancient settlement of national significance, the area's identity has been defined more recently (in the context of a history spanning millennia) by the production of whisky for export on a global scale. During the last decades of the nineteenth century, Campbeltown boasted over 20 distilleries operating simultaneously, and was the undoubted hegemonic power of the established Scottish regions when it came to whisky production. Such a place is unrecognisable from the contemporary aesthetic: a post-industrial west of Scotland town reliant on very different industries from those of Victorian and Edwardian Campbeltown. Nevertheless, whisky production, chiefly within Springbank's walls, remains a major employer, with three distilleries currently operating in Campbeltown. Glengyle, reopened in 2004, had been closed since 1925 and was resurrected within the original building. Glengyle is owned by J. & A. Mitchell Ltd, under the chairmanship of Hedley G Wright, whose forebears had owned the distillery during its former period of production. This distillery, whose annual production level stands at around 25,000 litres of alcohol, operates for six weeks each year using the same production team who effect the unique production process at Springbank, and could easily be described as the antithesis to its sister distillery only a few hundred yards down Glebe Street; it is modem, efficiently and chronologically laid out in relation to the stages of production, from milling, to mashing, to fermentation, distillation and filling. Glen Scotia is at the other side of the Esplanade, the most obvious division between the old village of Dalintober and the town itself. It opened in 1832 and is owned by The Loch Lomond Group, but is no less important in contributing to Campbeltown's contemporary whisky landscape. Such a drastic decline, from its then status as 'Whisky Capital of the World' to having only three distilleries in the present day is indicative of a Scotland and a Britain that have changed immeasurably during the intervening years. Campbeltown whisky's imperious repute, followed by the ruinous decades of the 1920s and 1930s, and its current state of reemergence, can be explained through several factors: a combination of arrogance, insularity and, most crucially, economic and commercial disasters occurring far from Kintyre. Campbeltown's demise as a whisky powerhouse was ensured in 1934 with the closure of Rieclachan Distillery. During the previous decade, a huge market in the United States had been all but eradicated with the country's policy of prohibition. In 1929, the Great Depression would have global ramifications, reducing in simple terms the drinking capacity of the population of Glasgow, where much of the whisky was transported from Campbeltown for supply to blending companies. Transport-wise, Campbeltown whiskies struggled as a result of the increasing use of rail transport, something Kintyre's unique geography does not practically allow for. However, the Campbeltown distillers were also responsible for their industry's discredit during the inter-war years. Some distilleries began to effect their distillation process too quickly; in an attempt to produce spirit in greater quantities the distillations were rushed, which in turn produced a spirit less refined, less pure, containing sulphur and other vulgarities. This led to some distillers being accused of having matured their spirit in herring barrels, so unpleasant was the final product! (Herring fishing was another important industry in Campbeltown at this time, hence the particular deduction). At the same time, Speyside distilleries in the North of Scotland were producing fruitier whiskies, an alternative to the robust oiliness at the heart of the Campbeltown style. The 'Pattison Crash', induced by the fraudulent Pattison brothers, who controlled a number of Scottish distilleries (before their bankruptcy in 1898) and were imprisoned for fabricating accounts to make their businesses seem profitable, and for masquerading low quality spirit as high-end whisky, was another decisive factor in Campbeltown's demise. Around the same time, the Boer War (1899-1902) and the First World War (1914-18) disrupted traditional shipping routes and effectively stopped production. The reaction to the former issue was the passing of the Immature Spirits Act in 1916, stipulating that Scotch whisky had to be matured for three years in a bonded warehouse (the roof sealed with steel bonding) before it could be considered whisky. The act was presumably passed in such a year for the reason that legislation so trivial in the context of a World War could be passed without time and attention for protest. Springbank has been opened and family-run since 1828, enduring for almost two centuries, gaining a cult following and somewhat legendary reputation around the world. The distillery's appeal for a whisky aficionado, or indeed the intrigued beginner, is almost endless: Springbank for a start is Scotland's oldest independent or family-owned distillery, that is to say it is not owned by a major drinks company. This is the only distillery in Scotland overseeing 100 per cent of its production process on-site, and the only one to produce three malts in one distillery; Springbank, Hazelburn and Longrow, the latter two malts being named after former distilleries in the town. On entering the malt barns, the large cellar-style halls where the barley, all of it Scottish, is laid out to be malted, you are greeted with a dense, golden carpet, and a smell of moist, sweet air, something like peaches or apricots, at the very least an aromatic suggestion of somewhere balmier in climate. If you are alone, there is silence, but for the distant whirr of the kiln, and the slightly spooky knowledge that before you, the production team as they are called, have been in, ensuring a 'floor' of barley is carefully maintained, all emptied out and levelled by hand, turned repeatedly and temperature-controlled, a formidable effort for only two people at a time. Just to survey over their efforts induces a sense of atmosphere, which the silence of the place heightens even more. The noise of the kiln, where this load of germinating barley is heading to stop that process, calls, and you walk past murals by Campbeltown pupils portraying Springbank and Campbeltown, two entities of different size but of great distinction both. The kiln area sees you break a wall of warmth as you come out of the cold into a soft, chalky air. The oven face emits sooty warmth, the crackling of the kindling a rustic reminder of what the distillery is all about: tradition. Eyes dry from the heat, you compose again and look over some of the dials adorning the stone walls, clearly from another time. The combination of these walls, the cast-iron kiln doors, the slightly antiquated-looking measuring equipment and the powerful drone of the blower firing hot air through the drying barley, creates a truly gritty, industrial atmosphere. Tradition intertwined with modernity. Leaving the lumps of peat lying waiting for their purpose, and the lumps of oil coming from the belt equipment of the blower, you walk through to the mill room, past chalkboard scribbles about barley lying in each of the ten storage silos, or 'bins'. When changing shift, the next production staff will know what has been milled and what remains in any of the bins. Communication and trust are so important here and throughout the production. The distillery is full of nooks and crannies, with wooden shutters continuing the image of a cellar. The winding path through the production stages gives the idea of an adventurous stumble-upon, rather than a clinical, efficient distillery. Regardless of this being actually by design, it makes for a unique atmosphere in Scotch whisky. The mill and the mash tun have a combined age of around 170 years, the mash tun being the senior. These rooms, effecting the separation of the barley seed (milling), then the extraction of its sugars using heated water (mashing), are cold and silent when there is no production there, yet they carry a presence befitting a building of such historical value. The only noise is the wind against the heavy doors and the voices of the workers in the yard and in the warehouse areas; it is a genuinely eerie place. It seems strange, but if there is one locale in which a combination of inanimate objects can still create an aura it is Springbank. Thinking of the number of Campbeltown men and women passing through whose craft has forged this tradition, it is perhaps less of a surprise. The hot mush created from the mashing is like porridge, the misty air is sweet again but hot this time. The product from this, wort, is fermented in a room with six massive, 24,000-litre drums, known as washbacks. There is a reek of carbon dioxide, a waste product from the crucial conversion of sugar into alcohol. To make whisky you have to make beer, but this substance, known as wash, is a cruder version than any microbrewery bottling. The stillroom has three stills, rare in a country of double distillers, allowing them to make Hazelburn, its triple distilled malt. Longrow is double distilled and heavily peated. Springbank is the classic in the range, distilled two and a half times; technically this process uses all three stills, but is not regarded as a triple distillation. These grand copper structures are arguably the most striking of the distillery aesthetic. Another hidden point of interest in the labyrinthine building is a now unused coal-chute, belonging to the era when the stillmen shovelled coal to heat the spirit for distillation. Mercifully, a combination of an oil burner and steam coils are used for heating these days. Into the warehouse (pick from anyone of seven) and the smell that greets you is truly brilliant: fruit, flora, spice and alcohol infuse in the air, an invisible haze that employs the senses somewhat miasmically. The effect on the nose is when spirit, or when over three years old whisky evaporates from casks, a phenomenon known as the 'angels' share'. Casks are like living organisms; the wood releases character from its previous contents, be it rum, sherry, bourbon, wine or Madeira. Conversely, there is a release of content from the cask, hence the ever-so-mildly intoxicating mixture in the air. Etched on the casks are key pieces of information: age, production number, and most crucially, which of the Campbeltown malts is contained inside, maturing silently for several years before the cask may even be handled. It is a solitary existence, and again, the inanimate nature of the building means very little; there is an aura and a presence from the moment you step in. The bottling hall is the final stage, and this sees at least eight pairs of hands ensure every bottle is filled, corked, labelled and packaged to the requisite standard. Each year Springbank sends around 30,000 bottles to over 40 countries; this may sound a lot, but in relation to the giant distilleries bottling in terms of hundreds of thousands, it is minuscule. Springbank's rarity is its strength, a whisky produced with intimacy and sincerity, the local people who make it aiming for quality over quantity. John McCallum was born and brought up in Campbeltown and is twenty-three years old. He studied International Politics and French at Stirling University, followed by a period of study in Paris. He worked as a sales executive for Springbank Distillery from 2012 to '13. He coaches Pupils A.F.C. under-18s and is himself a talented amateur footballer. John describes himself as 'a sporadic writer on various subjects for the Courier, Oban Times and Herald in the past'. I am sure that readers will join me in wishing John well as a writer, a vocation for which he evinces real promise. I am grateful to Mrs Iona MacNeill, Campbeltown, for having passed on to me a whisky-related article sent to her from Australia. The story is not unfamiliar to me, but hitherto I had come across only scraps of it. The writer was Stephen Phelan, and the article, titled 'Spirit of Romance', was published in the Melbourne daily newspaper, The Age, on 25/1/2014. The subject is a Japanese sake company apprentice, Masataka Taketsura, who was sent to Scotland to study whisky-distilling and travelled the Highlands and Islands taking menial work at various distilleries. While in Campbeltown he married Rita Cowan, who accompanied him to Japan when he returned there in 1921. Her family evidently disapproved of the marriage and she became an 'outcast' and 'never saw home again'. The article does not actually state that she belonged to Campbeltown. Can any reader advise on her origins? 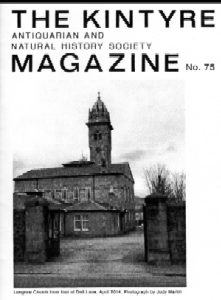 Coincidentally, there is a 'Mrs Cowan of Ballochgair Cottage' in 1947, mentioned on p 14. Taketsura would ultimately establish Japan s first dedicated whisky distillery, 'Nikka', on the cold, remote coast of Hokkaido Island, where 'the weather and water of the region provide the closest approximate conditions for replicating Scotch'. Neither he nor his wife lived to taste the 'Yoichi 1987 vintage', which was voted the best single malt at the World Whisky Awards several years ago. The cyclists of Campbeltown and district held a meeting on Tuesday evening last for the purpose of forming a club, when the name agreed on was the Kintyre Cycling Club. After enrolling 21 members, the meeting proceeded to the election of office-bearers for the coming year, and the following were elected, viz. - Councillor Thomson, Captain; Messrs D. Mackay and J. Colville, directors; Mr D. Ralston, hon. secretary and treasurer; and Archibald McMorran, bugler. It was agreed that during the months of June, July and August the club should muster every Saturday afternoon at three O'clock on the Esplanade, starting therefrom at 3.15 on whatever tour may be agreed on. The only part of the uniform agreed on as yet is a blue helmet with the initials 'K.C.C.' wrought in black and gold. On Saturday last the club had a pleasant run down to Southend, which distance they accomplished in 1 hour 17 minutes with one stoppage. We understand that the trip today is to be to Ballochantee. 2016 Harold A. Ralston, Mt Pleasant, Wisconsin, USA.